Dan, where's the love??? SOB with the Fosgate won't sell it!!! Offered him his price..said no. Did some tube rolling and decided to keep it. Wow, I see why you fell in Love with it, that is Awesome!! Magnaryder wrote: Dan, where's the love??? SOB with the Fosgate won't sell it!!! Offered him his price..said no. Did some tube rolling and decided to keep it. That's fucked up. Sorry to hear that. Last edited by Magnaryder on Tue Mar 18, 2014 11:10 pm, edited 1 time in total. Congrats Ray you are spoiling yourself awesome. Congrats Ray!! Glad you finally were able to make a deal on a Fosgate! Congrats on your recent pickup too- enjoy! At 3:20 this morning my Fosgate pre escaped the GreatWhiteNorth and landed safely stateside. I 'should' have it in my hands early next week. In the meantime I'll spend my time testing tubes for the great tube rolling event. Ray, it's a real shame you are not very excited about getting that Fosgate! helicopterpilotdoug wrote: Ray, it's a real shame you are not very excited about getting that Fosgate! I didn't want to threadjack over in Sunfire, but it arrived today. I guess Doug and I got lucky on the same day. I played 2 songs, just to make sure it ran OK and not enough to even get an impression. 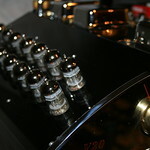 I did roll in 2 deParavacini 7DJ8s and a pair of Telefunken 12AX7s instead of the Svetlana tubes. I did get some vintage Sylvania 12AT7s in the deal. More later. I spent Saturday afternoon and evening at the New Vintage HiFi of Pittsburgh(Beemer's) new digs in Allison Park, Pa. What a place! 3 floors of great things going on. We drank some Crown, ate some stuffed peppers and burgers hot off the fire and spoke of things musical. I may have found the perfect (non-horn) speakers to run with the V20. Tom has a pristine set of Energy Reference Connoisseur 22s. I've heard these speakers before but never powered by a CF amp. They sound perfect with the 20Watt CF amp, so I think they will sound REALLY good with the V20. Tom played music that I was very familiar with and the CF/Energy rig acquitted itself very well indeed. Bass was deep, powerful but not bloated. I'm surprised Energy was able to integrate the woofer and (million dollar) tweeter so well. These are very musical speakers. I can't wait to get my hands on a pair.